My dogs, Tim and Joe, were both getting old. I’d been taking them to the vet. I’d paid a ridiculous amount to have their teeth cleaned. I walked them in the park rain or shine, three or four times a day. I picked them up to help them onto the couch so they wouldn’t hurt their backs. I walked all the way to 20th street and carried back a big bag of their favorite dog food back from Trader Joes. In return, they would curl at my feet, bark when the doorbell rang, nestle against me when I watched TV, lick my hands and gaze at me from across the room. They were my loyal hound team — and we looked after each as well as we could. My body was another story. I ignored it as much as I could. I ate bowls of ice cream late at night and told myself that my walk from the subway to the office qualified as an exercise regime. Instead of attending to my body, I led a life of the mind, working late, deep inside my skull, occasionally buying larger trousers. My body was a scary thing, no doubt hiding awful secrets which it would eventually unleash and kill me. I would wake up in the middle of the night with hypochondriacal worries which I would grind on in the dark, rather than going to the doctor. My body was to be denied, feared, beaten back and pushed down. But my body is the dog of my mind. The voice was telling me that just as I loved my dogs who were loyal and loved me back, my body wanted nothing more than to serve me too, and for as long as possible. If only I would let it. Instead, I treated my body like a cur, neglected and malnourished, chained to a tree in the yard. I had to start looking after the dog of my mind, at least as well as I looked after the weiner dogs curled up at my feet. So I began to watch what I eat and to exercise regularly. I lost thirty pounds. I went for a physical and the doctor discovered early prostate cancer. I had surgery and it looks like he caught it in time. I feel stronger and leaner and better than I have in ages. The dog of my mind wags his tail and bounds around in glee. Years ago, I discovered the idea of the artists’ date in Julia Cameron’s classic book, The Artist’s Way. She encouraged us to plan a time each week to focus on take our inner child. Go to an art supply store, a museum, a walk in a rose garden. Smell the crayons, gaze at the Monet, read some Keats, listen to the entire symphony with your eyes closed and your earbuds in. Nourish your soul and it will feed you back. I often find myself lost at my computer, realising that my knees are cramped, my back is stiff, my buttocks asleep, my eyes fogged. My mind is happy to keep grinding away at the project but its dog needs to stretch and walk around. Now I am careful to pay attention and heed its needs. But what of my artist’s soul, that bony child in my head? He needs exercise too. He needs to be fed and loved. To be shown picture books and paintings and lovely vistas. He needs to be smiled at. He needs gentle love and support. He needs to have his drawing encouraged, his ideas nurtured. My mind can be a bully, though I know that’s not his instinct. But the other bits of me need to be cared for too. A life out of balance is not worth living. Previous Post How to find your biggest fan. Oh Danny. Such a subtle way of telling us the turmoil you’ve been through. And yes, we most likely all neglect our vessel and ignore it’s deire to be attended. All of the work you have done since Beginings is a journey that you have taken, but it hasn’t been alone. Each of us have done this with some sort of realisation and epiphany. I cross my fingers and toes and hope you sail through to 100, I want to continue on this journey, silent a lot if the time perhaps, but with you and the treasured sketchers, and to live, love, laugh and learn for ages to come. X Andrea in Melbiurne. So poignant. Mind/body balance. We strive for it in yoga and you remind us not to forget our art. Another great writing from such a creative guy. Words of wisdom. Thank you for the reminder! Wow. Loved this. I’m so guilty. Thank-you for bringing this to my attention. Sammy and I had recently started running 1-2 miles a day together. Sammy is 70 in human years and he’s not totally on board, although neither am I! But after reading this I’m going to make sure we keep going! Thank you once again. I’m glad you mentioned “The Artist’s Way” because I need to pull out my morning pages and continue my journey. I am plagued with Rheumatoid Arthritis which is an autoimmune disease always causing problems throughout my body. It seems as though the only time I get out is a trip to the doctor. I need my artist date with me! Thanks for the push. Well put, my friend. I start each day with 30 minutes of exercise. And when I don’t, I know it. Then I create at my computer, getting up from time to time to stretch out the kinks. My inner child gets inspired by beautiful images on Pinterest, shopping trips to Interiors oriented stores and reading. Even a trip to the grocery has its moments. It’s a delicate balance. Shine on. Take it easy dude we (the and students) need u around a long time! And greetings from Doolin Ireland where my sister and I will be drawing all week. Seriously, be well. Thank you again. This is a perfect description of me and my inner dog. I I love your very thoughtful and down to earth reflections. Inspiring in many ways. Hello Danny! I want to say that this is your voice, the voice I first heard the first time I read, “The Creative License” yet I know you have other music in your repertoire. This is the song that reminds me of things I need to remember. So thank you. Balance, and success are not to be owned we can only rent or borrow and the rent is due every day. Sometimes I struggle with that but it helps to get by with “a little help from my friends.” Only in my case it is a lot of help. What would I do without cliches. Perhaps I just need to embrace the cliches……. I wish my mind’s Dog was more of a Kitten. Trying to warn me about life’s dangers. 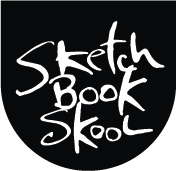 So tomorrow I’ll be enjoying some play time with my Sketchbook Buddies! Thank you … i needed to read this today! I remember a quote “when the student is ready, the teacher arrives”. I hadn’t realised the student was finally ready but it took your post to make me stop and look inside. Baby steps but better than making time or sitting on a numb derrière. Boy oh boy. You’re so right. I hate that you’re right but you so totally are. Now I have to revamp my day so I can walk the dog and feed the kid. But without that I’ll be just a mind without a purpose and in a shell of a body. That wouldn’t be good. Thanks Danny. Well written. Do ya think my dog would like a pink leash?? This is great! I love it. Didn’t realize how much this struck home. Thanks. Now it’s time to walk, feed, cherish, and just BE! This is a beautiful post, well written. Thank you for sharing! What a wonderfully written piece. As an overstressed 55 year guy with some heart issues, my cardiologist recommended yoga as a way to reduce stress. Although I am an avid hiker, I think that yoga will be a welcome addition to my life. Again, this is a great piece and I look forward to going through your blog.